There’s no doubt about it, Booking.com’s great at generating bookings. After a quick analysis of their search page, it’s pretty clear why. They’re the masters of conversion. Booking.com is plastered with small messages and techniques which influence guest behaviour. They are known to run experiments, A/B split testing thousands of variations to find exactly what colour, position, call to action and text generates the most bookings. It’s impossible for managers & hosts to run similar experiments on this scale because we simply don’t have the data. Although Booking.com’s experiments are designed for their user base, it’s still a good idea to utilise some of their tried & tested techniques. The first result in Booking.com’s search is usually a deal. This is no accident, Booking.com are aware travellers are searching for the best deal relative to quality. The most important factor for offers are their price reduction & scarcity. Booking.com make it incredibly clear how much guests save and how long they have left to take advantage of this deal. The countdown timer creates an anxiety to book before it runs out, which is only relievable by a purchase. What guests don’t consider are these deals aren’t really scarce, Booking.com constantly rotate deals and supposedly fabricate them. It’s all in the messaging. Humans are social creatures driven by crowd behaviour. It’s why reviews are so important for travelers buying decisions. Again, Booking.com know this and clearly display four instances of social proofing (star rating, numerical rating, number of reviews & best sellers)! Travellers are instantly reassured which sub consciously removes barriers to booking. Interestingly, the property with only 1 star has a “Best Seller” tag, which circumnavigates the negative rating! Essentially creating a win win regardless of rating. Booking.com deploy well-known strategies amongst traditional retailers because they work! Every price has it’s hypothetical “retail price” and it’s current price. In reality the property never retails at the higher price, but it incepts the idea that the traveller is getting a good deal – something most people are looking for. If you’d like to learn about all the pricing techniques companies use, read this comprehensive article. Hotels & holiday rentals are scarce resources – unlike traditional products, only a small number of people can make a purchase (booking) for particular dates. This creates competition for booking. Most companies don’t play on this inherent trait of accommodation. However, Booking.com make FULL use of scarcity. They inform visitors about the demand for particular properties, how many people are watching and how many rooms are left! It’s worth noting that highlighting the number of rooms and availability may negatively affect conversions if they are unimpressive and make the resource look bountiful. For smaller companies, I’d only show these metrics on properties that have demand. Holiday rentals are even more scarce than hotels. Hotels have a limited number of rooms but holiday rentals are a single unit! It’s worth taking advantage of this trait, even if it just involves adding labels like “high demand”. 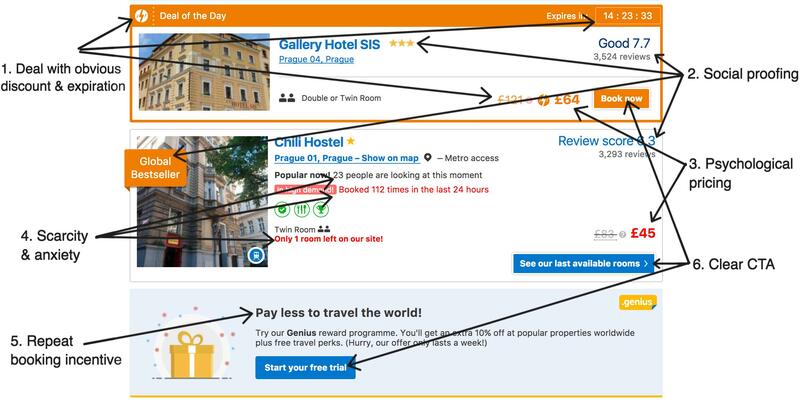 Within their search results, Booking.com advertise a reward program to incentivize travellers to make repeat bookings. Repeat bookings are vacation rentals best way to increase direct bookings from OTAs. A lot of guests love returning to places with good memories, however, it’s becoming increasingly difficult to attract previous guests with competing messages and offers from OTAs. Therefore, it’s critical to offer a discount or reward program for returning guests. Make this clear and remind guests of the benefits before and after a booking. An obvious but sometimes overlooked technique is the CTA buttons/links. Booking.com is excellent at making it incredibly clear to visitors how to proceed in every scenario, whether it be booking or to signing up to their reward program. Buttons are visible, the text is clear and colours are coded for different actions. With most sites, including Booking.com, 80% of the conversion is made before visitors click the CTA. However, without a clear and compelling CTA, visitors may fall away because they don’t know how to proceed and the mental energy to figure it out isn’t worth it yet. Make your CTA’s obvious, clear and compelling.